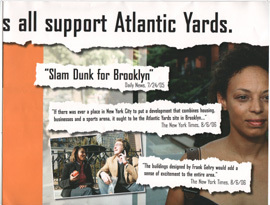 The latest "liar flyer" might be re-deemed the "tired flyer"  after all, do neighbors of the Atlantic Yards proposal footprint need to be reminded over and over again that "New York's major newspapers all support" the project they love to hate? The joke is that Ratner didn't include any pictures of tall buildings... again. As for the expected prevarications? 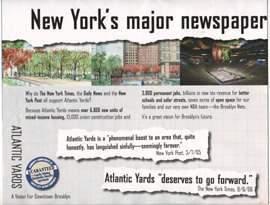 Atlantic Yards Report has written extensively on: * the "Guaranteed" seal of approval, * the jobs claims, and * the claims of billions in new tax revenues. The new brochure backs down from what AYR calls the "$6-billion lie," this time going with the more vague claim "billions in new tax revenues." But the most tired fabrication that Ratner is unwilling to let drop is the fallacy that the Atlantic Yards plan is in "Downtown Brooklyn" (it's still in PROSPECT HEIGHTS as far as we can tell). The photo of the gratuitous happy mixed-race couple is a reprise from the previous flyer, which also featured several photos of happy brownstoners, the reluctant Ratner covergirl and many pictures of not-tall buildings.